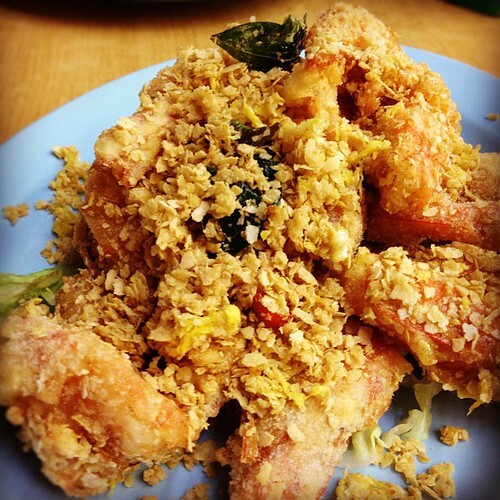 bayya's eats… and other stuff: I.want.cereal.prawns! I bloghop a lot. And most of the blogs I hopped into are food blogs. And no, they aren't incidental clicks. In fact, I bookmarked them. The downside of regular food-blog hopping is that you end up craving for a certain something after seeing or reading about it. Funny thing is, you can read on a lot of foods, yet when something (totally random) hit the spot, you end up hankering for that particular one. Anyway.. I was trying hard to recall just what was it that made me want to eat Cereal Prawns so much. After almost a week of salivating at the thought of eating this, I eventually dragged 3 guys to Changi Village to have this. My brother, my hubby & my son. My mission that night: EAT CEREAL PRAWNS! I initially planned to head to East Coast Lagoon Food Centre but decided against it. Heading there on Sun evening will mean at least 1/2hr of waiting for car park lot and another 1/2hr of waiting for a seat. So Changi Village it was. I had wanted to dine at 89.7 Supper Club but somehow or rather, we ended up at Ah Nam BBQ Seafood instead. Good, though. The dinner crowd has subsided and there's ample dining space. Fresh tiger prawns costed in corn flour and deep fried before being tossed into butter fried with curry leaves, chili padi, egg and NESTUM.. etc. 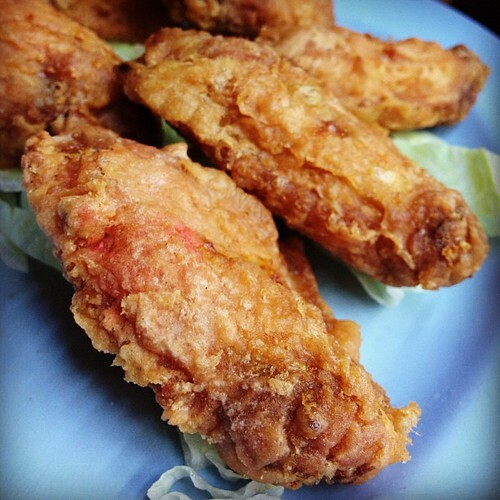 Deep-fried chicken marinated in shrimp-paste. Awesome stuff! I had initially wanted to order the Honey Chicken but decide to try these instead. Something more saltish and savoury. AND definitely crispy! A hit with the 3 guys. Which guy doesn't love their fried chicken anyway?? My foodie colleague told me that using ONLY the 'winglet' (chicken wing sans tip) is the best way to prepare Har Cheong Kai. Whoa, thumbs up here! 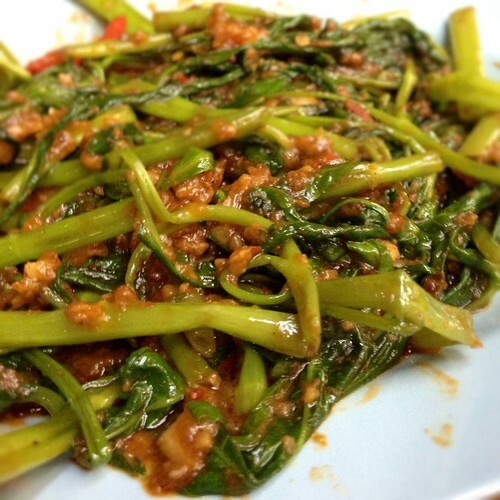 My must-have vegetable dish at 'zhi char' eateries. Ah Nam's version is a favourite of mine, although the spiciness isn't always consistent. Another hit with the guys. It's bad enough that I made them eat the cereal prawns with me, so I ordered their favourite food item to make it up to them. 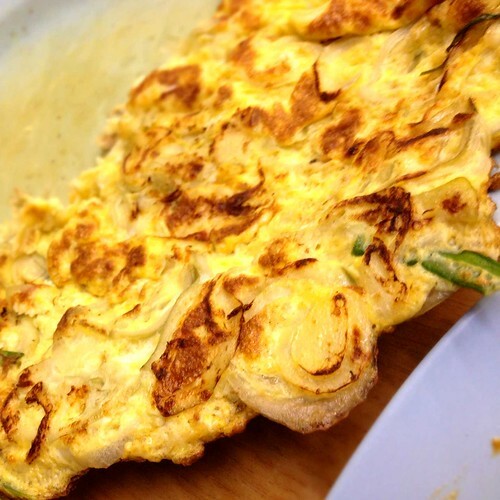 But seriously, omelette…? When dining out?? Pfft.